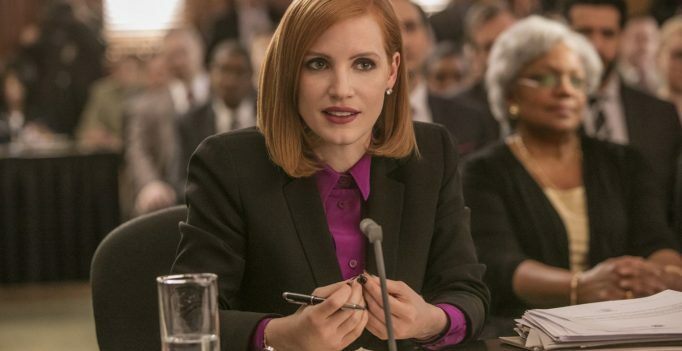 Solid pacing and a talented cast make up for a struggling script in Miss Sloane, director John Madden’s political thriller that has been generating Oscar buzz in recent weeks. Zero Dark Thirty Academy Award nominee Jessica Chastain carries most of the film with her remarkable performance as Elizabeth Sloane, a feared and much-sought lobbyist on Capitol Hill. Cold, calculating, and never shaken, Elizabeth takes on the biggest challenge of her career when she agrees to lobby in favour of gun control legislation. It is a decision that threatens to ruin her reputation as a winning lobbyist as well as her career. “Our system is rotten,” states Elizabeth, and who could help but agree with her? At a time when a billionaire real estate tycoon with no experience in public office is poised to become president of the United States, the suggestion that corruption and greed have led to the irreversible decay of the democratic system isn’t exactly earth-shattering news. Yet, despite the opinions of the characters on screen, the film itself maintains a tone of objective neutrality regarding issues of gender, lobbying, and gun-control. The message seems to be that these things don’t matter – not because they are not important issues that affect the lives of millions of people, but because if those who lead can be bought and sold then government will fail its citizens regardless of how those citizen’s political allegiances align. Miss Sloane is the first film written by Jonathan Perera and his script is one of the film’s only major flaws. 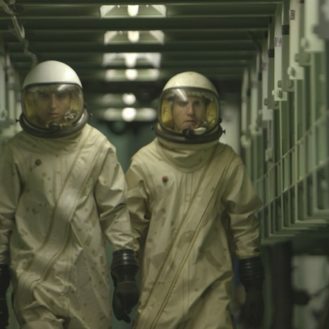 One gets the sense that with a less talented cast and director, the complicated plot and over-written dialogue would have tied itself in knots before it even got started. The Oscar talk has been brought on mostly by Chastain’s superb performance as Elizabeth. Though the script itself is, at times, clunky and contrived, Chastain manages to keep her larger-than-life character contained and believable. It is largely due to her tremendous skill that Elizabeth avoids becoming a caricature or succumbing to the usual tropes that cling to strong female characters in positions of power and professional competence. Instead, Elizabeth is at once likable, terrifying, sympathetic and chilling. As commendable as Chastain is in the title role, it is debateable whether this film would resonate as strongly had it been released at another point in history. Ultimately, Miss Sloane is a timely portrait not of a broken woman but of a broken political system.